We all know how powerful Twitter is. It has been estimated that people tweet over 500 million times per day (with over 6000 new tweets per second). Being one of the biggest social media platforms out there, Twitter hosts an overwhelming amount of content. However, just like any other medium, at times it becomes quite tough to filter this content or search for a specific tweet. If you have invested hours looking for the right piece of information on Twitter, don’t worry! You are not the only one. When it comes to Twitter, we all face setbacks in trying to filter the most appropriate content. 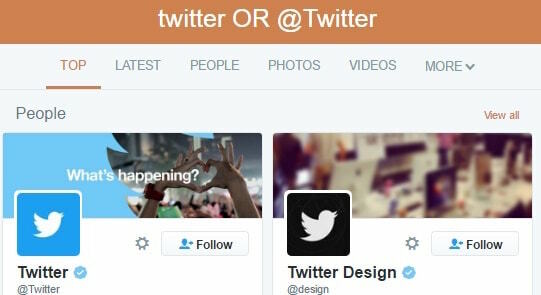 To make things easier for its users, Twitter has come up with a new feature called Twitter Advanced Search. 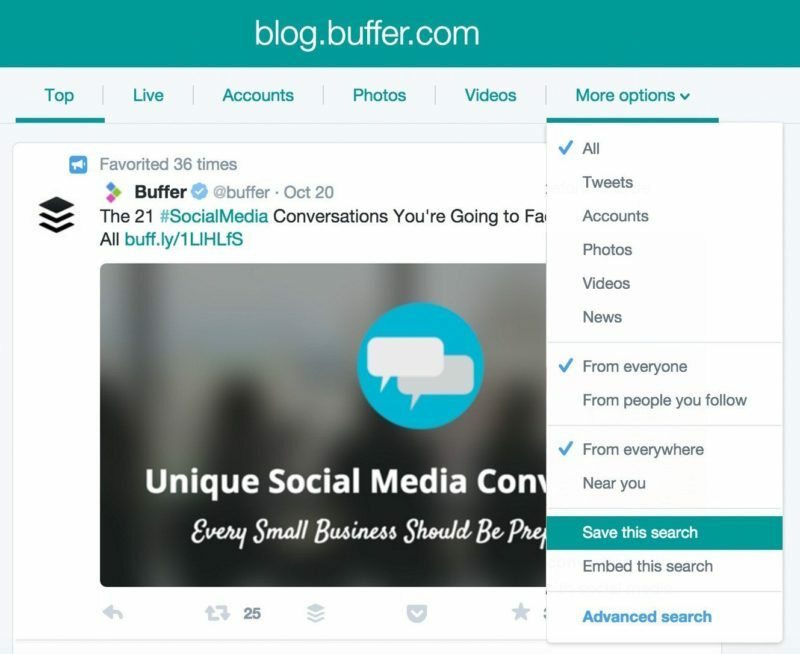 It might sound all new to you right now, but you can master Twitter’s advanced search tool in no time. In fact, you can use it to boost your marketing and sales strategy as well. Searching on Twitter is no longer a tedious task. It is high time you step up your game on Twitter and start searching like a pro! In this post, I will make you familiar with some foolproof ways to be a social media ninja, while saving you time and effort. Let’s get started and decode the Twitter advanced search feature. If you haven’t used the advanced search option yet, then don’t worry. Start with the basics and make yourself familiar with the common operators and how you can use the search page. Twitter has already published a guideline right here that might come in handy to you while searching for something. 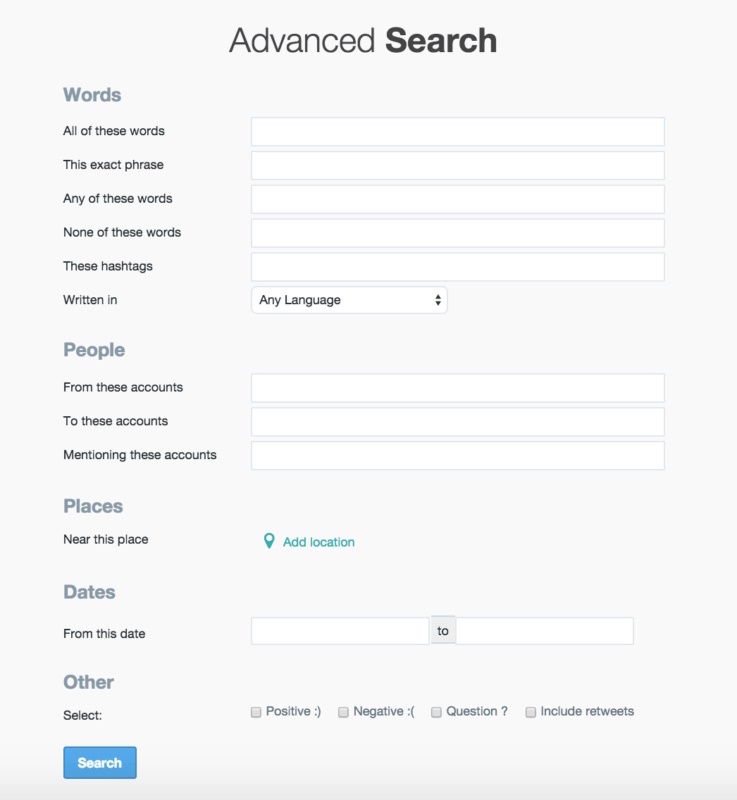 With Twitter search, you can filter content on the basis of words, people, dates, geographic locations, and a lot more. Additionally, there are plenty of operators that you can use to narrow your search. 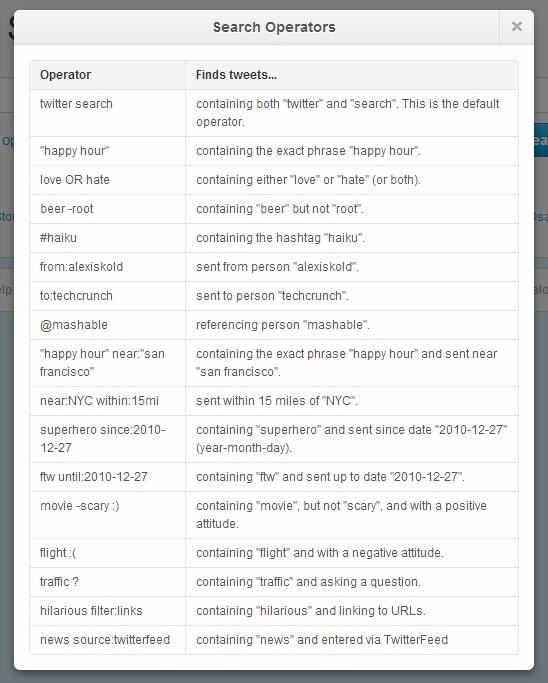 Here are some basic operators you can use while searching for something on Twitter. Go ahead and give it a try. Identify a negative attitude towards a word, or limit your search to a specific location. After getting familiar with all the advanced features, try capitalizing on these expert suggestions. Needless to say, the biggest motive for using a social media platform such as Twitter is to use it as a marketing tool. If you use it wisely, you can make the advanced search option your biggest marketing weapon on Twitter. Just keep the following suggestions in mind. This is one of the best ways to generate more leads in less time. Use the “words” section of the advanced search feature thoughtfully, and look for the most relevant keywords or hashtags that are associated with your brand. You can search for an exact phrase, omit certain words, combine different words together, or simply look for a certain hashtag. As a digital marketer, you should always have a list of keywords and hashtags that are related to your brand and industry. You can use this technique not only to monitor your brand or track your competitor’s moves but also to keep yourself updated with ongoing industry trends. Additionally, this strategy can help you to filter user-generated content while eliminating unnecessary noise. All you have to do is use your hashtags and keywords wisely while looking for anything on Twitter. 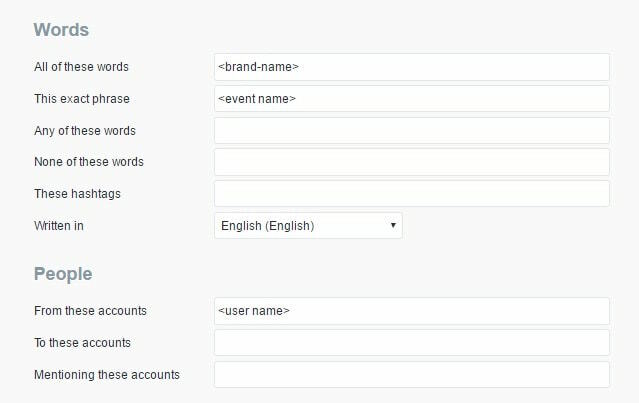 Twitter advanced search has introduced the feature of username search query, which is one of the easiest ways to generate leads and identify key users. With this feature, you can identify leading influencers related to your industry. You can also track conversations between different accounts by specifying their names in the “from/to these accounts” section. Through tracking conversations, you can learn more about your competitors and how they are interacting with major game players. You can benefit by tracking insightful details about your industry or knowing more about an upcoming event or even a Twitter chat. Brand monitoring is one of the clearest uses of Twitter advanced search. Without the use of any third-party tool, you can gain insightful information about your brand. You can search for your brand in different ways by selecting specific time durations or by filtering the local content. Additionally, if you have recently launched a campaign or have hosted an event, then you can get to know how your audience is tweeting about it by including its name. Keep a constant eye on how other users are reacting towards your brand so you can monitor those reactions thoughtfully. If you find doing so overwhelming, then you can always use different brand monitoring tools to make things easier for you. We all know that content is the driving force of any digital marketing campaign. 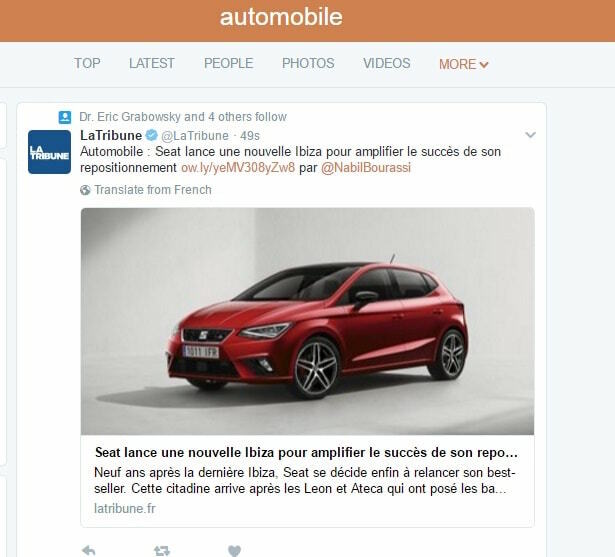 You can use the Twitter advanced search feature not only to find new content but also to seek inspiration for your next blog post. Just provide the topic name and “http” or any other related keyword. This will give you different web pages and online articles that are related to the searched item. If you are finding it hard to come up with the next big idea for your blog, why not start reading what other people are sharing related to the provided subject? Doing so will definitely help you a lot to generate a more effective content marketing plan. We all know how overwhelming Twitter can get at times. If you are looking for your industry-related keywords, you might stumble upon plenty of tweets that are directed towards your competitors. While it is always recommended to keep an eye on your competitors, sometimes you just need to filter out the noise and get only a selected piece of information. You can eliminate this unwanted noise by filtering out the keywords that are usually associated with your competitors. Then you will be able to focus better on your existing customers. Marketers know how hard it can be at times to handpick the kind of visually appealing content that can create a lasting impact on their audiences. Twitter is certainly a great place to discover photos and videos from different sources. The search result page segregates the content into different categories (like people, photos, videos, and more). You can easily get engaging photos and videos from various sources in no time. We all know that marketing is all about expanding your circle and meeting new users. Get to know more like-minded people and expand your circle on Twitter by following just the right kind of individuals. For instance, if you want to get in touch with fellow local marketers, you can simply search for a keyword like “digital marketing” and limit that search within a certain location. This search will provide a list of different accounts that have a similar interest in marketing as you and are located nearby. You can simply follow the accounts you like the most to expand your overall circle. Social media listening is certainly an art that might take you a while to master. Nevertheless, with the advanced search feature, you can step it up a little and keep a strict eye on what your audience is saying about your brand. Additionally, you can get to know what different sources are writing about your brand or about an event. Use the advanced search feature to get to know any news or stories people share regarding your brand. You can always filter the search results and look for “news” to gain insightful knowledge about the ongoing industry trends or your brand. The advanced search feature is not just for marketing. You can use it to boost your sales and get in touch with more prospective customers. Twitter can be an excellent lead generator. All you have to do is be savvy about how you utilize it. Here are some ways to generate more sales from using the advanced search feature. We all know the golden rule of marketing: with a smaller target pool, it becomes easier to generate more leads. With Twitter advanced search, you can make lead generation happen and save your time and resources as well. For instance, if you own a local business and would like to target your audience only from a selected city, then you can identify these users by using the “Places” option of the search. Additionally, you can look for specific people and further narrow the search on the basis of a certain time duration. 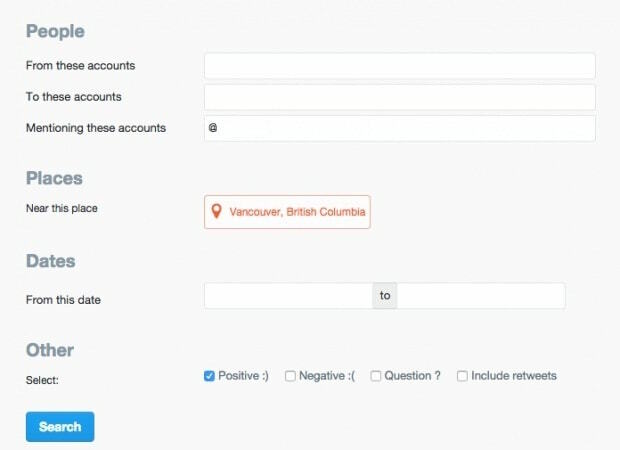 Twitter might already host millions of active users from your country. Use the advanced features and make sure that you target your audience wisely for effective lead generation. You might fall short of sales ideas while pitching your clients. 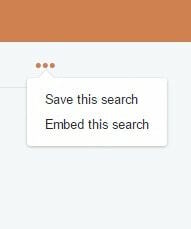 With the advanced search feature, you can easily research any subject and gain an in-depth knowledge about it in no time. Use the “Words” section to look for industry-related trends and know what’s in and what’s not. This search will definitely help you understand the dynamics of your field and know what other industry leaders are doing. As complicated as it might sound, Twitter can be an excellent tool for performing market research. With it, you can get to know about your brand from the perspective of your users. You can always analyze the way they are reacting towards your brand (or your competitors) by analyzing their sentiments. Additionally, you can search for different sources and get to know about the response of an ongoing marketing campaign. You can always create a Google sheet to record these responses and later use it to perform market research. Marketing and sales are the prime motives behind using the advanced search feature. Nevertheless, you can also use it to provide unmatched customer support to your audience. Twitter has come up with an excellent sentiment tracking tool that can help you reach out to unhappy customers in no time and avoid an unforeseen crisis. With this tool, not only can you identify the customers of your brand but you can also get to know about the reactions of your competitor’s users as well. For instance, supply a few keywords that are related to your competitors, and track their happy (or unhappy) customers by selecting the provided sentiments. You can also use this tool to reach out to your happy customers and get their testimonials or to invite them to an upcoming contest. There are many ways you can use this advanced feature. If you want to provide unmatched customer support to your audience, then you should definitely use the advanced search option for finding questions from other users. Too often while mentioning a brand’s name, users misspell it or even forget to mention the brand’s Twitter handle. You can always use the advanced search option to find these questions that might go unanswered without your efforts. From the “Other” section, simply select the option of “Question?” Then provide the relevant keywords to filter unanswered questions. Walk a few extra miles to provide unparalleled support to your users. I’m sure they would appreciate it. Twitter is all about being quick and responsive. However, there are times when your customer support team might miss certain tweets. With the advanced search feature, you can find unanswered questions, as well as appreciate people who have shared your content. Sometimes, a simple retweet can go a long way. Be as responsive as you can and engage with your audience. You can always look for a certain kinds of tweets from your audience to make sure that they always get a reply. Try to find phrases like “how to,” “why is,” “what should,” etc., to find content that might be relevant to your customer support team. 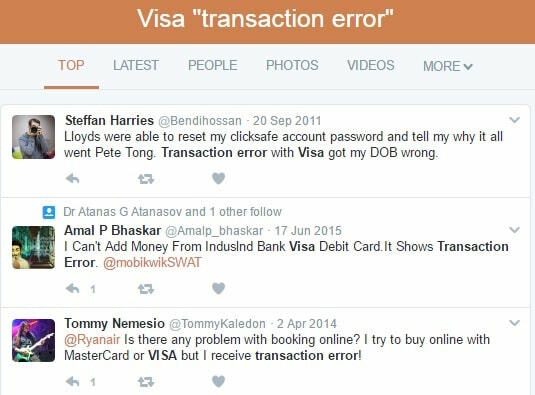 For example, after searching for tweets that have “visa” and “transaction error” as the exact phrase, you can reach out to individuals who are facing any transaction related problem with their Visa cards. After finding the kind of content that would be directed to your brand, you can go a step further and find some indirect queries as well. You can always try to search for different phrases and look for potential clients. Refine your search and impress new users with your excellent customer support. For example, if you represent MasterCard, then you can always look for customers who are not happy with Visa or any other competitor of yours. There are different Boolean operators (“or” and “and”) that you can use while filtering content and getting in touch with your audience. Great! You are almost there. After learning how to use the advanced search feature to level up your marketing or customer support game, get yourself familiar with some useful tools that will save you time and effort. This strategy will save time and keep your content in one place for future reference. After the search results are displayed, you can further narrow the content by using different filters. 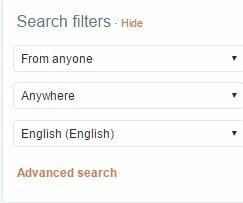 Use the option of “Search filters” to get tweets from the people you follow or from a nearby location. 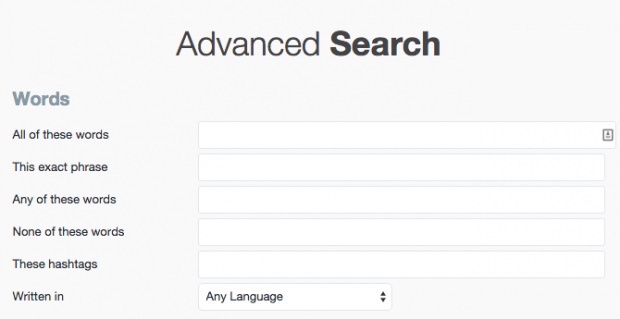 You can also perform your search in a specific language as well. 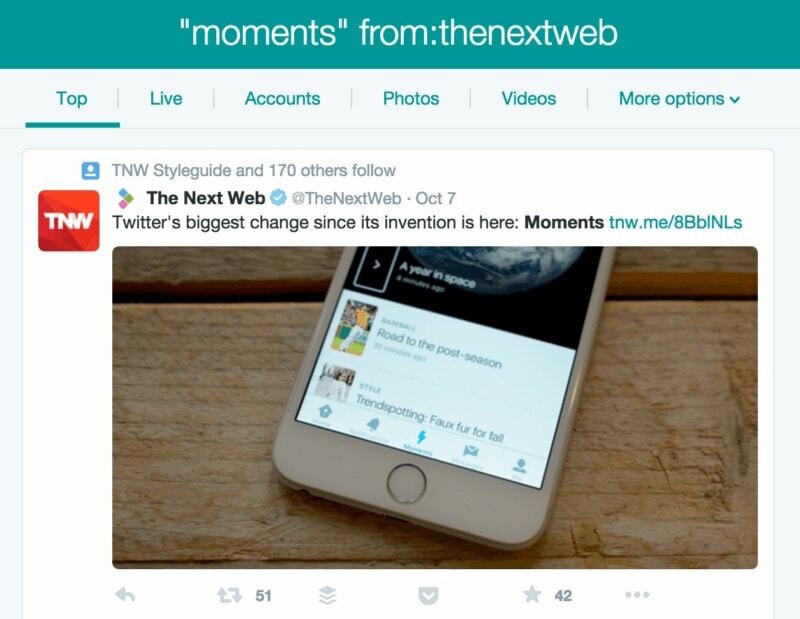 Twitter allows you to embed the search results on a different web page. You can easily use this feature to make your website or blog more interactive. After supplying all the parameters and getting the respective searched results, click on “More options” (…) and select “Embed this search” to get the embedding code. You might already know how easily you can filter content on Twitter on the basis of different parameters. After getting your search results, you can simply select the type of content you want. By default, Twitter displays the most popular content. You can also see the most recent content in the “Latest” bar. Additionally, you can retrieve just photos or videos as well. Twitter’s advanced search allows you to look for a specific type of content from a provided source. In the “From these accounts” section, simply provide the name of the account that you want to research and subsequently fill in all the other details. This will provide you with the content shared by that account. How convenient is that? Last, but most importantly, don’t be robotic while using the advanced search feature. Don’t choose keywords and hashtags out of the blue. Instead, think from the perspective of your customers. Imagine what you would be tweeting about your brand if you were its customer. When you are looking for more leads, you should always look for phrases that are commonly used (like “any advice on” or “recommend”). Additionally, you can target specific words such as “dissatisfied,” “unhappy,” or “won’t recommend” while filtering tweets. Who knew that with Twitter advanced search, you could do so many things? From lead generation to market research, there is so much this amazing feature can do for you. Go ahead and give it a try. I’m sure it will enhance your experience on Twitter. Have you used the advanced search feature before? Do you have any hidden tricks that you would like to share with the rest of us? Let us know in the comments below! Want even more Twitter Tips? Be sure to check out our Twitter Best Practices. Thank you so very much for sharing your knowledge with others. Very good and informative post surely it is more informative and useful to the users who are much interested on Twitter . Thanks for sharing this informative post.really this post will helpful for many people,I have learned some great tips from this post about twitter advanced search. Great post ! It was very insightful and informative I have never used the advanced search feature before but because of your outstanding and detailed post I am definitely going to implement what you taught. Thanks for sharing this value-packed post and have a great day. This is really comprehensive post, I have learned some great tips from this post about twitter advanced search. I wanted to search something specific at twitter but due to lack of knowledge I failed to achieve the results. Thank you for sharing this great information. This post helpful and useful for many people ans in this post gave good explanation in detail that helps people. This post is about Twitter advance search.